How would you feel if you woke up tomorrow and your computer wouldn’t boot up? Would you be heartbroken because you lost all the photos of your children or grand-children? Would you be able to recover the document you have been working on for the last 2 weeks and is due tomorrow? 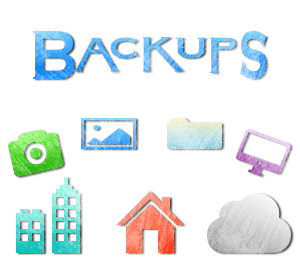 If you don’t have a backup plan then there is very little you can do to recover your data. Here is a 4 step backup plan that will give you piece of mind and a backup of the important information on your computer. There is a lot of options when it comes to backup hardware. You can spend as much or as little as your situation requires. There are 2 options that I like to suggest. The quick and easy hardware option is to get an external hard drive that is at least 1.5 times the size of the computers hard drive that you are backing up. This allows you to have plenty of room for old files and a complete backup of the computers hard drive at the same time. I recommend using a Western Digital My Book. They are sturdy, I have had one that has lasted over 3 years. Just make sure to never move it while it is on. I have also used a My Book for all my backups and it worked very well for me. Once I started backing up customer sites and files I decided I needed a complete and rock solid backup solution. The best solution for this is a Drobo. The wonderful thing about Drobo is that it has multiple hard drives configured so that the data is shared across all of them. The technical name for this type of storage is called RAID. A RAID backup system will allow a hard drive to fail and still not lose your data. Then all you need to do is replace the failed hard drive and the system will sync everything back up for you. This is a more expensive option but for me it is the best solution for local backup hardware. Make sure that if you purchase a Drobo that you purchase hard drives for it or that it comes with the hard drives needed. Check Drobo’s site to make sure you are getting compatible hard drives. No matter which hardware solution you decide to go with you need to make sure that you are backing up at least weekly. I use Mac’s so my backup happens automatically through Time Machine. This is a great feature that Apple released and all I needed to do is point Time Machine to my Drobo and the backups happen every time a file changes. Windows computers are a little more difficult, but you can easily setup a program like CrashPlan to do your local backups. CrashPlan will run in the background on your computer and backup you system any time a file is updated. If you are running a Mac I also recommend Super Duper, this allows you to make a bootable clone of your hard drive. This can be invaluable if your hard drive fails. An offsite backup is a backup of your data that is kept somewhere away from where the computer is located. This makes sure that if there is a catastrophic disaster, like a fire, you will not lose all your information. If something happens locally you can always use your offsite backup in order to build your information back. The backup service I use is CrashPlan. They have a free account for home and an inexpensive paid account for business. I have CrashPlan setup to upload my backups from my home to my office and from my office to my home. This way no matter what happens I will always be able to recover my data. CrashPlan also offers their own cloud storage if you do not have access to a remote computer. If you do not test your backups you might as well not have them. I always recommend testing your backups at least once every six months. This means making sure that you can access the data on the backup and that you are able to load it back to your computer without any issues. As always thank you for reading and be sure to like us on Facebook and follow us on Twitter.